DoublePane is a simple window manager for Mac OS X that is impressively useful. It works by resizing a selected window to fit precisely on one half of the screen – on the left or right – which then allows you to place another resized window directly next to it on the opposing half. This maximizes the available screen space and makes it extremely easy to transcribe information, giving you a significant boost to productivity when writing or doing research. For such a simple app, you’ll be surprised by how often you end up using it. 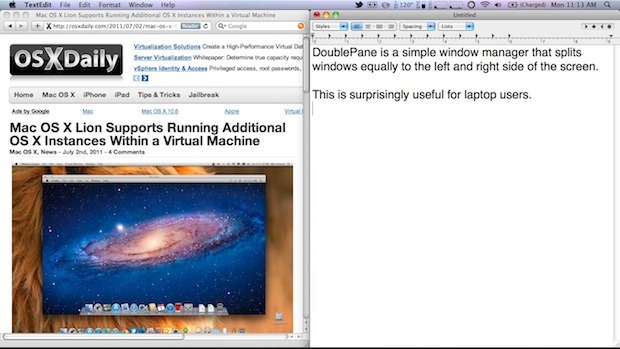 DoublePane is basically a necessity for any portable Mac user, so if you have a MacBook Pro or MacBook Air, or any Mac with limited screen real estate, don’t miss this app. It also happens to be free today, July 4th only, to celebrate Independence Day. You can access it from anywhere and it will automatically resize the foremost window to accomodate the selection. 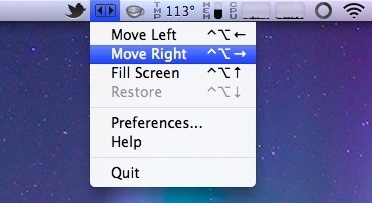 You can also choose to fill the screen with a window or app, which is useful but only marginally so in OS X Lion. The real value is in the quick split screen. Been using this for a while, it’s really nice. Moom is similar, but really they should both be free all the time. i use better touch tool, it’s exactly like aero feature, which is really useful for me. Thanks, I’ve used Cinch for a while but some Apps can’t/won’t go half screen in Cinch. I’ll try this out and see if they work with it. Could the icon be uglier ? Very useful app! I love it. It’s great that the app is free for the day – not so good to get the mailing on the day after. It would have been nice if it was not only a one day thing, you know for those of us who left early in the morning, didn’t get back home until early the next morning, and promptly crashed into their bed upon doing so. There is also Arrange from Trifle (http://www.trifleapps.com/arrange.html) with some interesting features.